William M. Rohe, Michael D. Webb and Atticus Jaramillo. 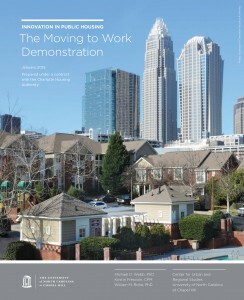 Since 2009, the Charlotte Housing Authority’s (CHA) participation in the Moving to Work demonstration—which the agency has branded as the Moving Forward program—has provided the agency with the flexibility to implement locally-relevant policies. Since then, the CHA has implemented numerous policies to achieve the program’s three goals: achieving cost savings, expanding housing opportunities for low-income families, and helping residents become self-sufficient. 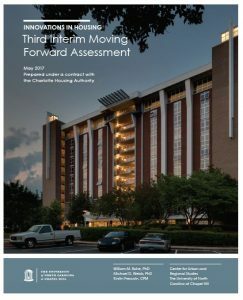 The Center for Urban and Regional Studies at the University of North Carolina at Chapel Hill has evaluated the CHA’s Moving Forward program from 2010 to the present. In addition to numerous smaller reports, we have produced a series of biennial updates on the Moving Forward program. Published in 2011, 2013, 2015, and 2017, these reports have provided a comprehensive assessment of the Moving Forward program and offered recommendations to improve its implementation. They have largely relied on program data, interviews with CHA staff, and surveys and in-person interviews with CHA clients. This report builds on those reports by providing an update on the Moving Forward program with a special emphasis on activities that have been implemented or modified within the last two years. The report also details CHA initiatives outside the Moving Forward program that have had a significant impact on the agency’s operations. February 2019. 46 pp. PDF file of publication. Michael D. Webb, William M. Rohe, and Kirstin P. Frescoln. The Center for Urban and Regional Studies, The University of North Carolina at Chapel Hill. Since January 2014, the Charlotte Housing Authority (CHA) has enforced a work requirement at five of its fifteen public housing developments. This policy mandates that work-able residents work 15 hours per week or complete, with case manager approval, work-related activities. Non-compliant residents face sanctions, namely loss of rental subsidy; the first residents were sanctioned in July 2014. CHA has provided residents with on-site case management since September 2011, and these services continued following policy enforcement. CURS recently analyzed work requirement impacts the on tenant employment and evictions through December 2014. While employment and income (as measured by percentage paying minimum rent) did not rise when residents only received case management, they did increase following work requirement enforcement. Further, those gains were statistically-significant when compared to tenants not subject to the work requirement. Contrary to some advocates’ predictions, enforcement did not correspond with an uptick in tenant evictions. 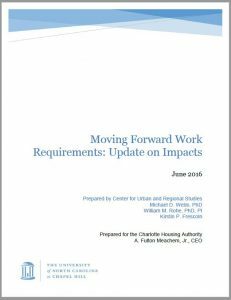 This evaluation brief provides an update of impacts of the Charlotte Housing Authority’s work requirement by extending the analysis through December 2015. Like our previous report, it analyzes changes in minimum renters, employment, hours worked and move-out rates. It also reports sanctions levied against non-compliant tenants. The report concludes with recommendations for helping work requirement residents move to self-sufficiency. June 2016. 11 pp. PDF file of publication. William M. Rohe, Michael D. Webb and Kirstin Frescoln. The Center for Urban and Regional Studies, The University of North Carolina at Chapel Hill. The Charlotte Housing Authority (CHA) has participated in the U.S. Department of Housing and Urban Development’s (HUDs) Moving to Work (MTW) since December 2007. As an MTW participant, the CHA has used the financial and regulatory flexibility afforded by the program to undertake a variety of new activities, collectively branded as Moving Forward (MF). Agencies participating in MTW seek to meet three goals: expand housing opportunities for low-income families, achieve cost efficiencies and encourage clients to move toward self-sufficiency. The CHA has used MTW flexibility to undertake three major initiatives and a number of smaller ones. The first major activity is a set of rent reforms that apply to all CHA clients, including increased minimum rents, incentive accounts, and income bands upon which rents are determined. Second, the CHA is piloting a work requirement paired with supportive services at five housing developments, and will soon expand this policy to all of its family public housing. Third, the CHA is working to diversify its housing portfolio by acquiring developments in higher-income neighborhoods and developing partnerships with organizations that specialize in housing the formerly homeless. Other MF initiatives include simplifying inspection procedures for developments with both public housing and project-based vouchers, allowing over-income residents to remain in mixed-finance buildings by transferring subsidies between units and adopting biennial inspections for high-performing Section 8 units. This report is the third in a series of interim assessments that the Center for Urban and Regional Studies has produced for the Charlotte Housing Authority. May 2017. 135 pp. PDF file of publication. William M. Rohe, Todd Owen and Sarah Kerns. The Center for Urban and Regional Studies, The University of North Carolina at Chapel Hill. Many North Carolina communities are experiencing an affordable housing crisis, which is particularly severe for those who rent. This report examines severe housing cost burden, overcrowding and substandard housing conditions among renters in the state. It identifies areas in our state with extreme housing needs, defined as having relatively high levels of at least two of the following three indicators: severe housing cost burden, overcrowding and the lack of complete kitchen and bathroom facilities. 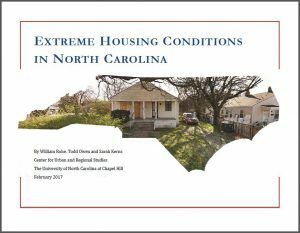 The report’s findings indicate that additional efforts are needed to improve housing conditions, reduce overcrowding, and lessen the housing cost burdens of renters in North Carolina. Without decent and affordable housing it is difficult for many families in the state to lead happy and productive lives. These housing problems also increase public health care costs and reliance on social support programs and lower productivity. The combined efforts of state and local governments are needed to reverse the negative trends in housing affordability and overcrowding and improve the quality of life and economic productivity of North Carolinians. February 2017. 44 pp. PDF file of publication. William M. Rohe, Mai Thi Nguyen, Michael D. Webb and Kirstin Frescoln. The Center for Urban and Regional Studies, The University of North Carolina at Chapel Hill. Over the past five years, CURS has been evaluating the CHA redevelopment project, the Renaissance, with a particular focus on the experience of those who were relocated from the original development, Boulevard Homes. The CHA provided residents with case managers and supportive services while the Renaissance was under construction. These case managers helped residents set self-sufficiency goals, and connected families with services like job training, educational opportunities, and health care assistance. Building on our previous evaluation reports, this final report provides an overview of the Boulevard Homes redevelopment process and its outcomes. 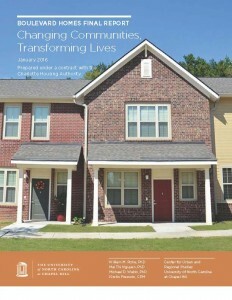 It describes and assesses the redevelopment process, including the design of the new development, the relocation of former residents, the attitudes of the former residents toward the relocation process and outcomes, the supportive services offered to relocatees, and the redevelopment’s impacts on the surrounding neighborhood and much more. This report was prepared under a contract with the Charlotte Housing Authority. January 2016. 114 pp. PDF file of publication. William M. Rohe, Michael D. Webb and Kirstin Frescoln. The Center for Urban and Regional Studies, The University of North Carolina at Chapel Hill. Approaching its 20th year of existence, Moving to Work (MTW) is a U.S. Department of Housing and Urban Development (HUD) demonstration program that provides participating housing authorities the flexibility to explore innovative policies. While 39 public housing authorities are currently participating in MTW, Congress is considering significantly expanding and/or reforming the program. 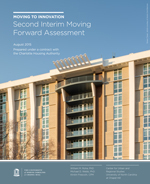 This report evaluates the Charlotte Housing Authority’s (CHA) efforts to expand housing choices, assist clients in moving to self-sufficiency, and achieve greater cost-effectiveness in delivering services through MTW participation – which have been branded Moving Forward (MF). Moving to Innovation: Second Interim Moving Forward Assessment is the Center’s most recent in a series of Moving Forward assessments. This report was prepared under a contract with the Charlotte Housing Authority. August 2015. 81 pp. PDF file of publication. Michael D. Webb, Kirstin Frescoln and William M. Rohe. The Center for Urban and Regional Studies, The University of North Carolina at Chapel Hill. This report provides a history of the Moving to Work (MTW) program, including its policy context and a timeline of participating agencies; catalogs the wide range of activities currently undertaken by the 39 participating agencies organized by MTW’s three statutory goals; and offers concluding comments both to guide current debates about extension of MTW agreements and to set the stage for future evaluations. 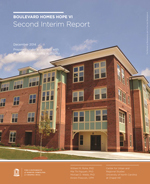 This report was prepared under a contract with the Charlotte Housing Authority. January 2015. 37 pp. PDF file of publication. William M. Rohe, Mai Thi Nguyen, Michael D. Webb and Kirstin Frescoln. The Center for Urban and Regional Studies, The University of North Carolina at Chapel Hill. 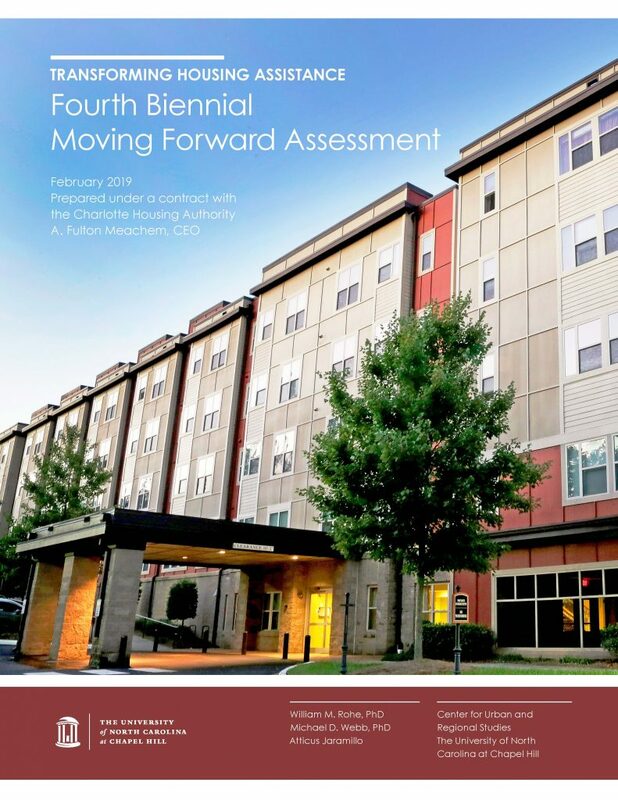 As the Charlotte Housing Authority’s (CHA) Boulevard Homes HOPE VI project moves into its fifth and final year, this report provides an interim assessment of the redevelopment’s progress. In doing so, it updates relevant sections of both the October 2010 baseline report and May 2013 first interim report. In particular, this report offers: (i) a review of development progress, including status and occupancy of the new Renaissance site; (ii) an update on community and supportive services and client progress toward self-sufficiency; and (iii) recommendations for CHA and its partners. This report was prepared under a contract with the Charlotte Housing Authority. December 2014. 47 pp. PDF of publication. William M. Rohe, Michael D. Webb, Kirstin Frescoln and Hye-Sung Han. The Center for Urban and Regional Studies, The University of North Carolina at Chapel Hill. The purpose of this report is to assess the characteristics, levels of satisfaction, social needs, and work efforts of those participating in the Charlotte Housing Authority’s (CHA) main Housing Choice Voucher (HCV) program. This report details the responses to a set of questions that address the following topics: social characteristics, housing experiences, and health of respondents; satisfaction with CHA, landlords, housing, and neighborhoods; economic insecurity and social services; and training, employment, and family self-sufficiency programming. This report was prepared under a contract with the Charlotte Housing Authority. Submitted September 2014. 48 pp. PDF of publication. William High and Todd Owen. The Center for Urban and Regional Studies, The University of North Carolina at Chapel Hill. This report examines poverty, unemployment, and per capita income at the U.S. Census tract level in North Carolina, updating a 2005 report. This deeper dive into the state’s most distressed areas using tract-level data reveals pockets of extreme distress in the state’s urban areas. Despite the prosperity of their surrounding communities, these urban tracts are even more distressed than their counterparts in rural counties. February 2014. 23 pp. CURS Report No. 2014-01. PDF file of publication. Publications may be ordered from the Center for Urban and Regional Studies, Campus Box 3410, The University of North Carolina at Chapel Hill, Chapel Hill, NC 27599-3410 or via email by contacting the Center at UrbanStudies@unc.edu.